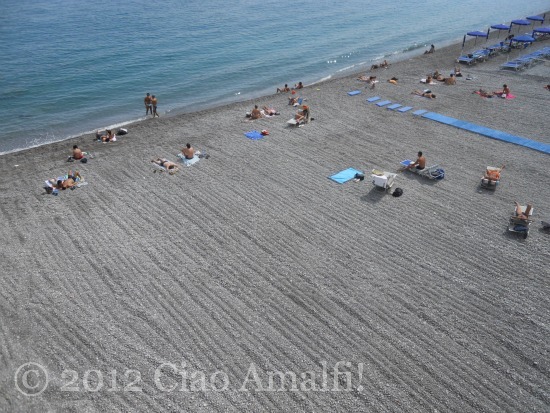 Yesterday afternoon I looked down and saw that the Marina Grande beach in Amalfi had been prepared for the summer with its pebbles neatly raked back into place and a freshly painted blue walkway leading down to the sea. It was fun catching the geometric pattern of the rocks, because it certainly won’t last long with the weather warming up. I caught a bit of late afternoon sun on the beach, but the swimming will have to wait a little longer as the water is still too chilly for me. But I did enjoy walking along the shore and then warming up my toes in the sunshine! It was beautiful watching the evening light, a group of young boys playing in the water and a vibrant red boat with a young crew team out practicing. Oh, yes, and a white sailboat. Perfection! Maybe it’s the Nebraska girl in me, but few things capture the feeling of summer quite like watermelon. Yesterday I stopped into one of my favorite fruit and vegetable shops in Amalfi. The couple ahead of me had asked for a piece of anguria (watermelon), and the woman in the shop was busy cutting off a big quarter. It’s pretty common here to ask for only a piece instead of an entire watermelon, especially since most refrigerators are so small. There was one lonely piece of anguria left, so (of course!) I brought it home with me. The temperatures are still very springlike here, but the flavor of the watermelon is a sweet reminder that summer is just around the corner! Yesterday evening I looked out the window and gasped, and then promptly ran to grab my camera. Something was happening outside that only rarely happens on the Amalfi Coast. Thick white clouds were billowing in off the sea and snaking their way up the mountains. This only happens when the temperature is just so and the humidity very high and the winds blowing in the right direction – a combination that seems most likely in these balmy May days with cooler evenings. Or, at least the only other time I’ve seen it was back in May 2007 on my second visit to the Amalfi Coast. The Amalfi Coast is a place of magic for me every day of the year. Yet, there are certain days when nature pulls out all the stops and the only thing left to do is gasp. And run for the camera, of course. Looking across to Ravello, the buildings along the top of the town were shrouded in a mist on both sides. Clouds swept over the Villa Cimbrone at the tip of Ravello, which is where I was lucky enough to be standing in May 2007 when the low clouds rolled in. 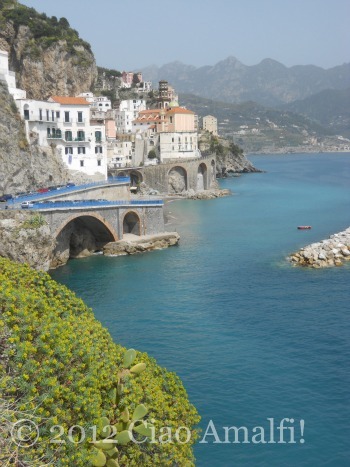 Maybe that’s when the magic of the Amalfi Coast really got under my skin. The last light of sunset lit up the face of the old man of the mountain beyond Ravello, the clouds surrounded him as if he were laying in a luxurious bubble bath. Looking down toward Pontone I could just make out the ruins of the medieval church of Sant’Eustachio. I watched as the mist floated around and through the holes of the church ruins shrouding them in mist against the rosy glow of sunset. There’s magic in these mountains, I know it. The clouds got as far as Scala before the mountains said stop. A cool wind came up from the mountains unexpectedly and began to push the clouds back out to sea. By the time it was dark it was clear again and I could see the lights twinkling in Ravello. How strange this battle between mountains and sea, and how beautiful. I love photographing the vibrant colors of spring on the Amalfi Coast. They change from day to day depending on the weather and what plants are blooming. Recently it seems that Atrani has been the subject of my photos more often than not. I just had to share them for all the readers with happy memories or a special connection to this beautiful village. It certainly is photogenic! The sea turns strange colors after a storm, almost the same turquoise and green on the small wooden boat I caught being rowed toward the shore in Atrani. I wondered where these two had been that morning. 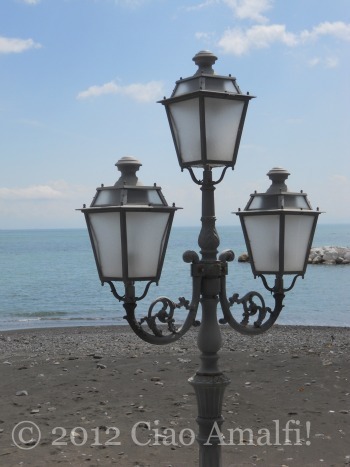 There are lamps along the walkway overlooking the beach in Atrani. Each one has three lights supported by an ornate design. I like the way they look with their twists and turns and curves standing out starkly against the blue sky and the sea beyond. It’s almost strange to think that soon this beach will be covered with blue and white striped beach umbrellas and sun beds all lined up. But that’s just as much its identity as the smooth black sand dotted with white stones is during the winter months. Another sunny day after storms, I spotted a plant covered with tiny yellow flowers, and the colors stood out so beautifully with the bright turquoise sea. The shape of the yellowing flowering plant, the cacti poking out and that intense blue were so irresistible that I had to stop and take a few shots. Just beyond I spotted a fig tree clinging for its life to the cliff edge below the road. It must be thriving on the views, I thought, because there wasn’t much else! Looking close you can see how big the figs have already grown. It’s not a bad view after all. The figs are already getting big! The seasons are changing and I know the warm weather will be here very soon. Summer brings many good things with it, but I’m trying to hold on to the colors, scents and beauty of these vibrant spring days for as along as I can! Let the busy days begin! If it hasn’t started to get rolling yet, the long weekend for Easter is the official start of the tourist season along the Amalfi Coast. 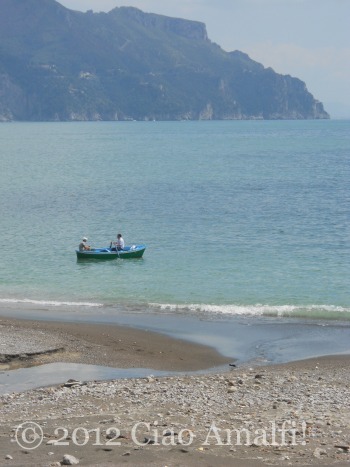 In the days leading up to Easter last week, the mornings were already buzzing in Amalfi. Tourist buses have started to arrive nearly every day from Sorrento, Naples and other destinations. 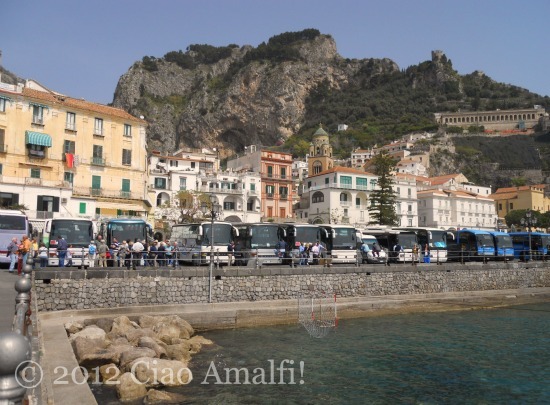 The parking lot in the center of Amalfi reserved for the blue and green SITA public buses and the tourist buses is filling up each morning. And after a quiet winter, the harbor is filled again with ferries to Positano, Salerno and Capri and smaller boats ready to go to the Emerald Grotto or set off for private boat tours. Where to? 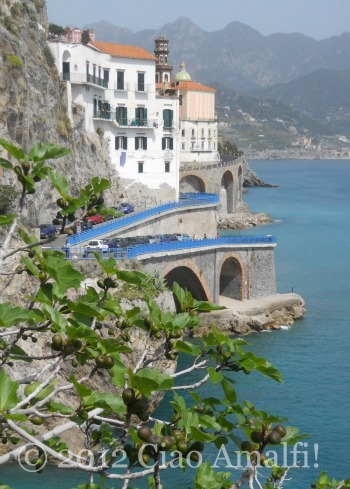 Positano, Salerno, the Emerald Grotto or Capri? While the warm beach days are still a month or so away, when the sun comes out you’ll now spot a few sunbathers here and there. And, of course, those brave few who don’t seem to mind the cold water! The first sunbathers of the summer season have arrived! While some people might grumble and groan at these first signs of the tourist season, I like watching the city change throughout the year. We hold our breath for a moment and make a wish that this season will be a good one, for us and for all the families that in some small way take part in sharing, promoting and protecting this beautiful coastline in so many ways.